to view the 40 + images. 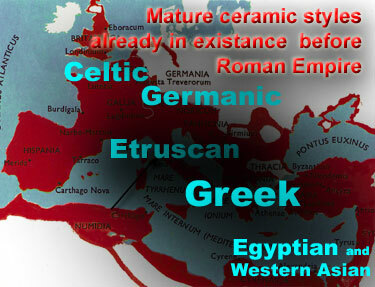 Detail map showing some of the main artistic styles already in existance before the Roman conquest. 1. The start of the Tutorial. 6. 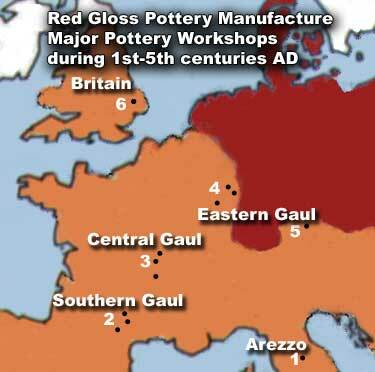 The Spread of Red Gloss Ware. 10. 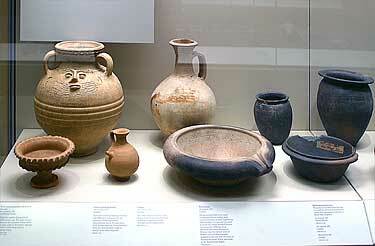 Fritpaste or Glazed Pot. 16. 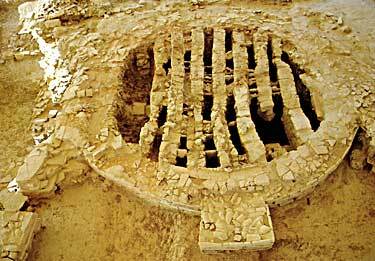 Roman Kilns in Europe. 000b Map showing Roman Expansion 300-100BC ca. 7058 Etruscan painted terracotta funerary burial urn ca.150 BC. 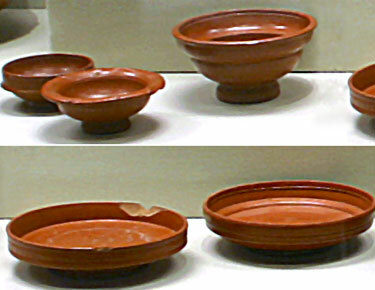 Late Helenistic(probably Ptolomaic Egyptian) Fritware. 000a Map of Italy ca. 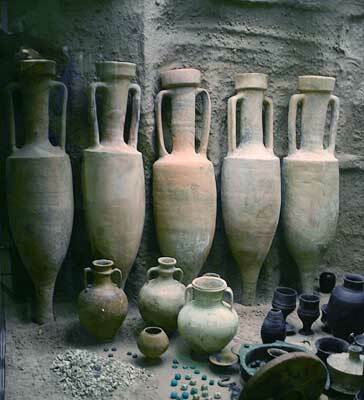 5th century BC. Rome was founded by Latin tribemen around the 7th century BC. 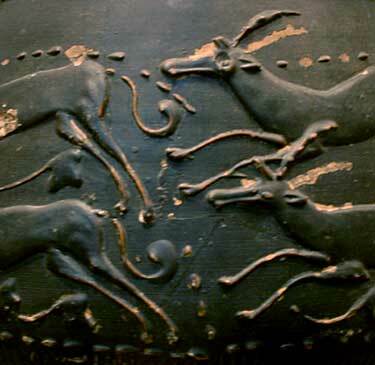 but subject to Etruscan overlords. Not surprisingly, most aspects of Roman culture was heavily influenced by this much more cultured people. 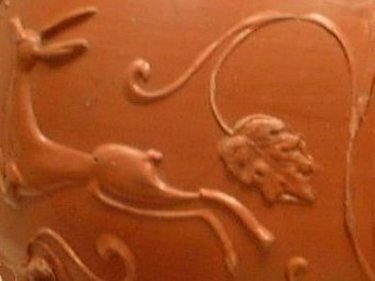 Roman religion, art, architecture - and, of course, ceramics owe a lot to the Etruscans. One must also add to this the influence of Greek and Carthaginian cultures. Roman culture was built on these three great civilizations. Uncivilized and aggressive, the early Romans were a militaristic tribe of bullying farmers out to conquer more and more land. 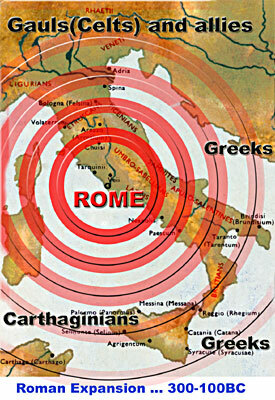 As the city of Rome grew in strength it became increasingly beligerent towards all its neighbours, weak or powerful. 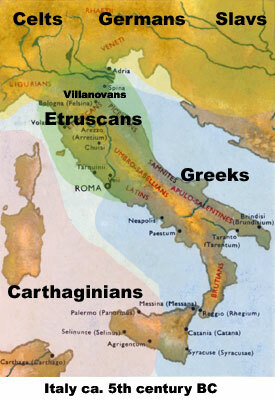 By the end of the 6th century BC, the citizens of Rome had thrown out their Etruscan overlords and formed a republic. As its military prowess and pride of nation became stronger, Rome picked off or absorbed smaller or weaker neighbours or went to war against more resistant people. (3) the Macedonians in the Balkans and Greece. Political strife, incessant warfare and expansion characterise the rest of the pre-Christian millennium in Italy as the agressive Roman Republic strove to gain control of more territory from all of its neighbours on land and sea. Before the turn of the millennium, often with considerable luck rather than fine judgement, Rome managed to achieve control over a vast area around the Mediterranean. Read "The Punic Wars" by Nigel Bagnell. 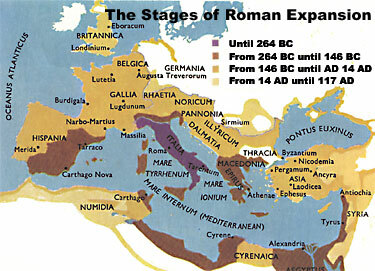 000c Map showing the stages of expansion of the Roman Empire. During the next 300 years this great empire stabilised at the centre, but still grew further. 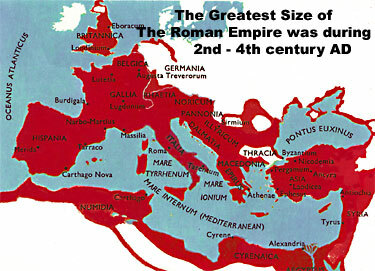 This map show the maximum extent of the Roman Empire around 300AD. From the north of England, it stretched south to Egypt; west from the Atlantic coast of Spain and Portugal to the River Rhine and the Black Sea. Still further south around the Mediterranean, from Morocco right across to Turkey, Syria and Palestine. At its greatest extent during the period from around the 2nd to 4th century AD. much of the Roman Empire was relatively peaceful and prosperous. Products of all kinds were traded across this vast territory. 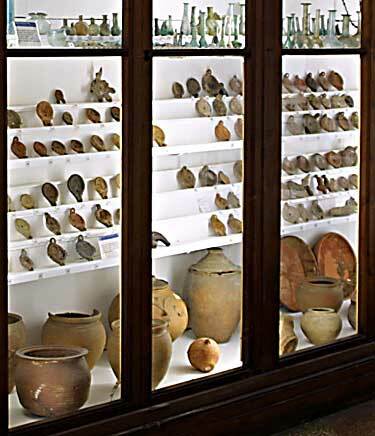 Enormous amounts of pottery were made and exported, great numbers of pots were used for transport or storage of wine, oil or water. 000e Map showing Roman World ca. 300AD. 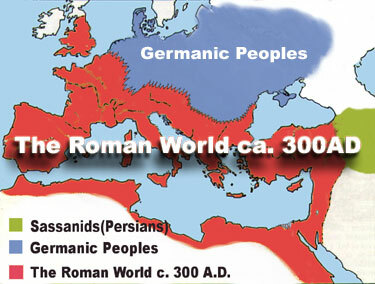 The Western Roman Empire(Europe) lasted until about 5th century AD when it was gradually overrun by Germanic tribes from across the River Rhine and crumbled into various feudal kingdoms some becoming "Romanised Barbarian" others "Barbarised Roman", the building blocks of Medieval Europe. The eastern half of the Empire - The Eastern Roman Empire(Capital:Byzantium/Constantinople/Istanbul) survived as the "Byzantine Empire" for another thousand years after the western half had disappeared. Byzantium suffered at the hands of the Crusaders in the 11-12th centuries AD, survived but was much weaker. It finally fell to the Ottoman Turkish onslaughts in 1453AD to be transformed into Istanbul. More Background History in Later Tutorials. Map showing Roman Expansion 300-100BC ca. Map showing Roman World ca. 300AD. 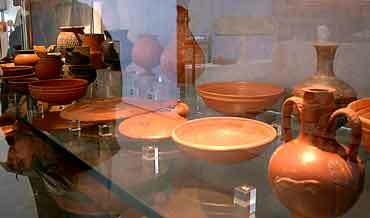 Typical museum exhibit of a collection of Roman Glass and pottery. 8010 Embossed double-walled bucket. BML. 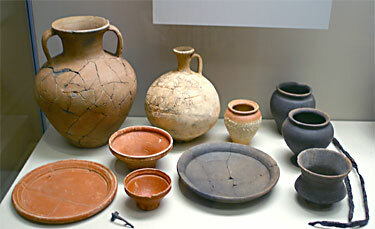 Gold and silver vessels, dishes and a variety of tableware were not surprisingly preferred to pottery. 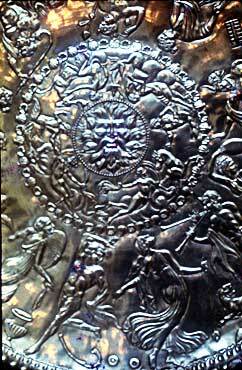 One of the attractions of this silver tableware was the embossed decoration; often termed " repouseé ", since it is made in relief by hammering from behind or within. The raised designs included classical ornament, human figures, even whole scenes. This double-walled bucket has a decorative band of flowers and leaves beaten in high relief in the outer wall. 8011 Embossed toilet bowl. BML. A ladies' toilet handbasin which imitates the soft curves and form of swans' feathers. 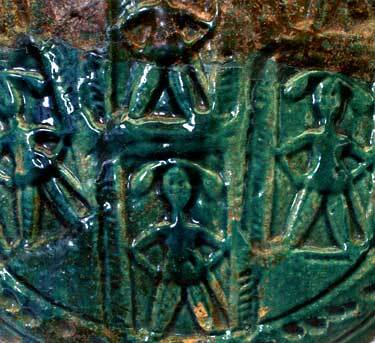 At the centre is a medallion in high relief depicting the Three Graces. 8012 Embossed serving dish. BML. This repouseé decorated silver serving dish is covered with a broad circle of figures dancing in a circle and a medallion at the centre. There seems to be a wild party going on! 8013 Part of the centre of the silver serving dish. 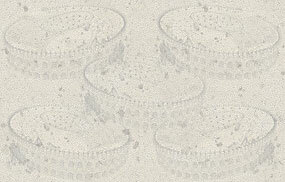 It shows the considerable detail achieved in this embossed decoration. 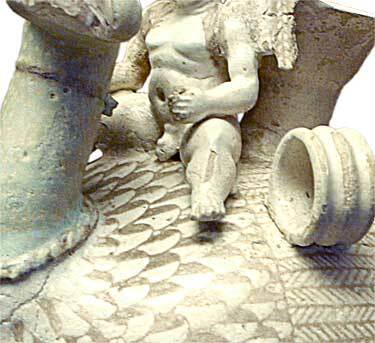 At the centre is probably represented the god of wine Bacchus surrounded by reclining, probably drunken, girls! 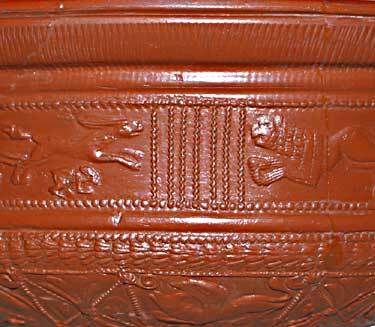 8014 Drinking cup, applied and relief decoration. Silver stemmed drinking cup with vine leaf and grape decoration. Part applied and part embossed. Ring handles with thumb and finger rests. 8017 Fine decorated bowl made in Central Gaul early to mid 2nd century AD. BML. 8027 Small press-moulds for lamps. BML. 8028 Two small press-moulded lamps. BML. 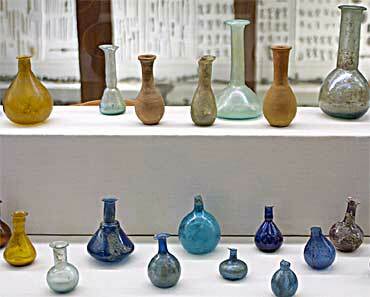 8031 Various Roman small coloured blown-glass bottles. Italy. MCB. 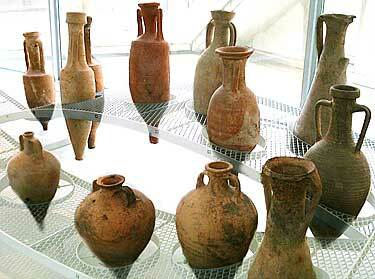 By the first century BC products of another craft were seriously threatening the Roman pottery industry: cheap coloured glass vessels. Alexandria was an important centre for making glass and exporting glass-making techniques before the Romans arrived. However, it was probably the Phoenicians or Syrians who invented the technique of glass-blowing with a blowing iron tube some decades before the beginning of the Christian era. This new technique transformed the ancient glass industry. The blowing iron was an iron tube about 1.5 metres (5 feet) long, with a mouthpiece at one end and a knob for holding soft glass at the other end. A blob of molten glass was collected on the knob end and rolled into a suitable shape on a flat surface of iron or stone. The shape could then be blown inside a mould or freely in air with occasional reheating. A solid iron rod was used to wrap, twirl, or pinch glass into desired complexities. 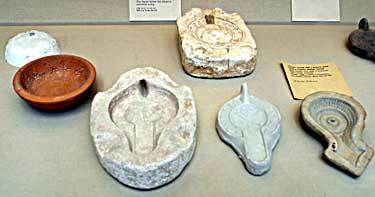 Handle, stem, or bottom also could be fused to the vessel when desired. 8032 Large,lidded glass vessels ht:25cm. S.France RMA. Simple or complex shapes could be repeated by blowing the glass bubble into wooden or metal moulds. Glass vessels like these two illustrated here, could be transparent, coloured, smooth surfaced and, of course, absolutely non-porous. This liberating discovery, probably made during the 1st century BC, gave rise to the astonishing growth of the glass industry in Roman imperial times. Commercial glass containers in great variety were mass-produced in common greenish glass on a scale that was not matched until the 19th century. 8033 "Cameo glass" - The Portland Vase.ca.80AD BML. In addition, luxury vessels were produced with an elaboration of skill that astonishes and often baffles the modern glass technician today. For example, fine "cameo glass" was produced by the Romans in the 1st century AD, as exemplified by this famous dark blue glass blown vase, the Portland Vase. Some workers developed the technique into an art-form. This technique is called cameo glass: glassware decorated with figures and forms of coloured glass carved in relief against a glass background of a contrasting colour. Such ware is produced by blowing two layers of glass together. When the glass has cooled, Roman glass engravers created such pieces by manually cutting away chunks of opaque white glass to a darker background glass layer. The details of the design were cut or carved by hand. 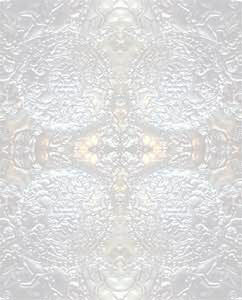 Such work could then be polished like precious stones. It became highly sort after everywhere. The impact on an expanding ceramic industry is difficult to judge but must have been catastrophic to some potters making for the higher end of the tableware market. The glass for this large cup or vase was coloured with manganese and colloidal gold, the vessel appears opaque green in reflected light and a translucent wine-colour when light passes through it. 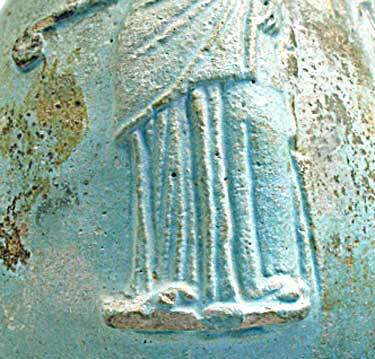 The openwork design, joined to the body of the vessel by bridges of glass shows scenes from the classical myth about Lycurgus, a Greek King who offended the Gods and was rather nastily killed. The shapes and colours multiply as the cup is turned. Roman coloured glass techniques of this calibre were not equalled until the 19th century AD. 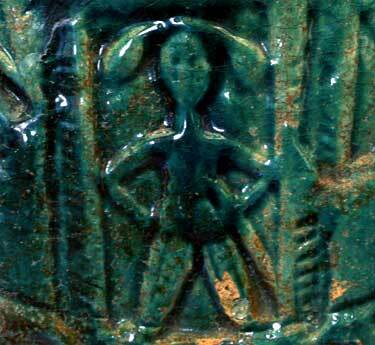 8039 A small Egyptian Fritware Amulet. 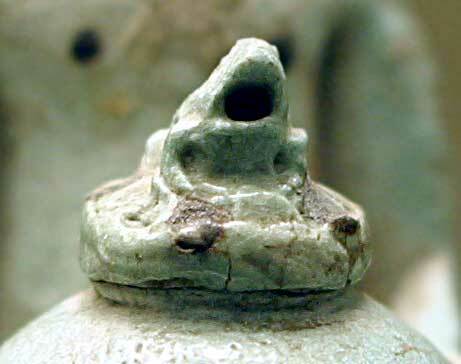 8040 A small Egyptian Fritware Amulet. 1. Mixtures of soda ash and powdered quartz sand and a little water produce a basic frit paste. When dry, a white fuzz of soda covers surface. Fired to between 800-900°C., the powdery mixture at the surface (high in soda and fine quartz), melts producing a glassy surface. 2. Silica(quartz/sand) alone melts into silica glass at about 1715°C. too high for a potters kiln or furnaces. 3. Some compounds(fluxes) cause silica to melt at much lower temperatures - as low as 800°C. The alkalies(Soda and Potash compounds) and Lead compounds are the most common powerful glaze fluxes. Borax is also powerful but much less common. Calcium compounds(Lime) are useful fluxes but not as powerful. 4. Ordinary glass is made from powdered silica(quartz/sand) mixed with enough fluxes(usually soda and lime) to make the silica melt at attainable furnace temperatures: such mixtures produce molten glass at around 1100'C. 5. A balanced glaze is a glass that melts completely but is too viscous to readily run down vertical surfaces. This is because it contains a stiffener or stabilizing agent). The most common glaze stabilizer is a small amount of clay. 6. A balanced glaze contains silica, fluxes and stabilizer. 7. 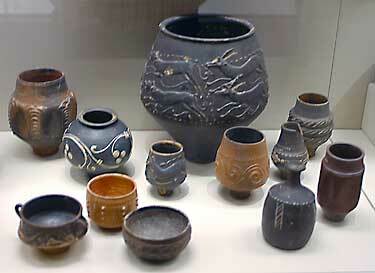 Various compounds, usually metallic oxides, produce colour in glaze. Copper produces a characteristic blue/greens in alkaline glazes, but apple/grass greens in lead glazes. Iron produces dull yellows in alkaline glazes but in lead glazes a range of amber/honey colours through to rich browns and blacks. Cobalt compounds produce a similar blue colour in alkaline or lead glazes. 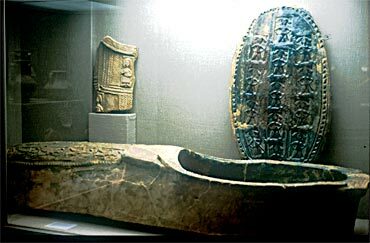 Click Picture for close details of the glazed coffin lid. 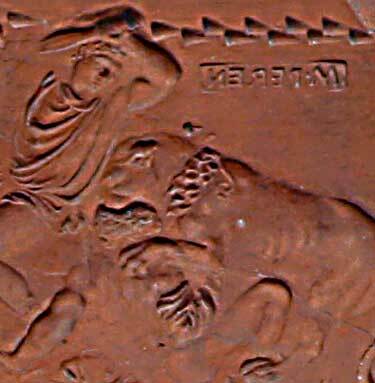 7019 Painted Urn from Prunay, N.France Late La Tèene culture 5-3rd century BC ht:12.2cm BM. 7020 Celtic vase with painted decoration ht:36cm Late La Tène ca.100 BC. Basel Switzerland. HMB. 8066 A Romano-Celtic drinking cup from Britain.The dark brown/black gloss was thin and has worn away. BML. 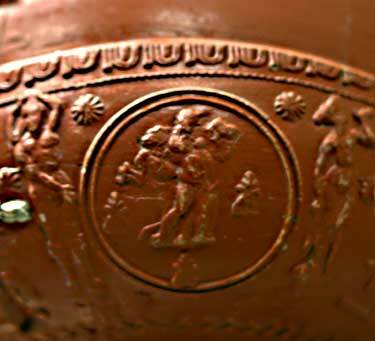 8067 A Romano-Celtic drinking cup with the dark black/brown gloss well preserved. Britain. BML. 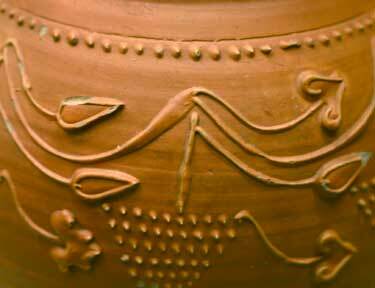 8080 Updraft kiln drawing: an ancient Cretan-Greek-Roman pattern still used today. 8081 Sectional diagram of this Updraft kiln pattern still used today. 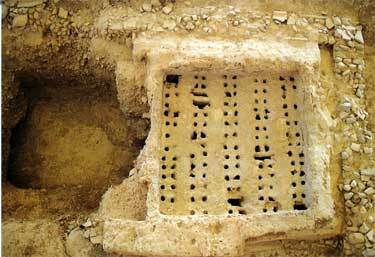 8083 Kiln floor - rectangular shape, Amphoralis, France. 8084 Kiln floor - circular shape, Amphoralis, France. 8085 8085 Circular Roman kilns - Reconstruction. 8085 Rectangular Romano-British kilns - Reconstruction. 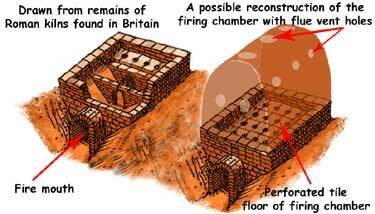 Drawing of Roman rectangular kilns excavated in England. That was the last illustration. I hope you have found Tutorial No.8 interesting and perhaps useful. The next Tutorial No.9 is the first tutorial of four on Chinese Ceramics.